The openaltimeter is a small, lightweight, low-power logging altimeter with an optional built-in LiPo regulator and a very loud beeper! It's aimed at radio-controlled glider pilots, particularly DLG fliers, but because the firmware is open-source it can be customised completely for other applications. Logging altimeter with better than 0.5m height resolution and 4Mbits of onboard memory. Log a full weekend's flying without needing to clear the memory. At-the-field launch-height readout. Optimise your launches with real-time feedback. 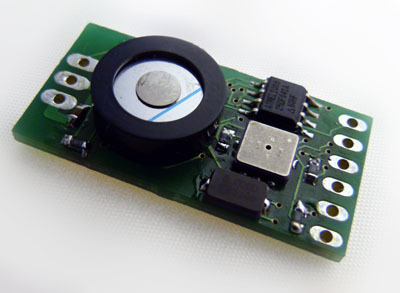 Fully configurable low-voltage alarm with 90dB sounder. Because the firmware is completely customisable new battery types can be added in the future. Optional on-board LiPo regulation using a high-efficiency Recom 1A switching regulator. Low-voltage alarm works both with and without regulator. The board can also be fitted with an old-fashioned linear regulator chip (untested). Assembled board, without regulator or leads, is 31mm x 16mm and weighs 3.1g. Current consumption averages 4.5mA when sounder is quiet. For a quick tour of the features and to see the openaltimeter in use, check out the following short video, available in glorious HD! The thing that really makes the openaltimeter different though is that the firmware code is freely available under an open-source licence. The board has been designed to be compatible with the easy-to-use, free Arduino programming system, which means even absolute beginners can be hacking their own custom builds of the firmware within minutes. No specialist programmers or expensive software licences needed: the same connecting cable that's used to download the data from the logger is used to re-program the board. Don't like the way it beeps at you? Want a custom startup tune? Want it to play "The Flight of the Valkyries" when you throw a switch on your transmitter? Want to log the battery voltage a hundred times per second to detect voltage glitches? Want to turn it in to a height-limiting switch for eSoaring? Want to interface it to other sensors that have a serial output (e.g. GPS) and log those? Want to connect it to your Jeti telemetry system? All possible with a bit of coding! You might say the sky's the limit (groan). If you're interested in hacking the firmware then you should check out the hardware page to get an idea of what's possible. The firmware page describes how the firmware is built, and has instructions on how to start hacking.